After weeks of snow and ice I decided to spend a little quality time in the Central Park Zoo’s Tropic Zone. It was just what the doctor ordered. It is warm, colorful, and filled with wonderful sounds and calls. If you like today’s montage how about signing up for my next Central Park Zoo Photography Workshop on Sunday, March 9, from 8:30 to 10:30. Experience breakfast and a photo shoot with our Tropical Birds and maybe we will be lucky and there will still be some opportunities for snow photos too. Hey Judy. Looks good on our bus in the middle of the Negev desert. 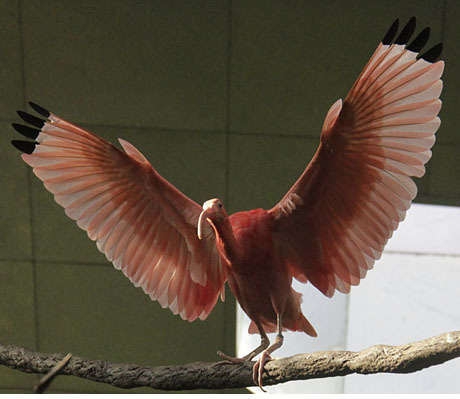 Again, fabulous photos and I LOVE the scarlet ibis with its wings outstretched! a much needed infusion of color in an otherwise grayscale north andover! warmed me up!